That's right theatre fans. Time is running out. It's Only A Play which opened on Broadway at the Gerald Schoenfeld Theatre this past October will play it's final performance on June 7. The show first premiered in 1982 Off-Off Broadway before making it's Off-Broadway debut four years later as part of the Manhattan Theatre Club's season. Cut to fourteen years and the show finally made it's Broadway debut. Now while reviews for the show were mixed it didn't effect sales as the show broke box office records and recouped in less than two months. Take that critics! Although it helped having an all star cast. You've all heard of Nathan Lane and Matthew Broderick right? They starred in a little show a few years ago called The Producers that won more Tony Awards than any other show in Broadway history. Ringing a bell? Now while I don't expect their latest reunion to win that many it is definitely a hit. Luckily you still have time to see it before it closes. Not only that but it is now possible to see this laugh out loud comedy at prices that can't be beat. Just give us a call and one of our friendly theatre experts can assist you with not only tickets for this show but any show both On and Off-Broadway. 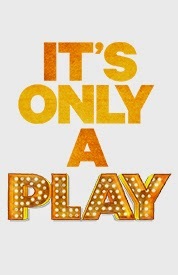 Get your It's Only A Play tickets at the Gerald Schoenfeld Theatre on Broadway. You will love it.